The Greek crisis of last July and its outcome have deepened interrogations in all Europe, both in the left and the right, about the future of the Union and what should be done with it. It is obvious that both Eurozone and EU are facing serious crises, which are repeated again and again, every time on a deeper level. Those crises lead to the appearance of radical forces (or forces pretending to be radical) in all Europe, as European nations are looking for subjects capable/willing of fighting for their social and national needs. This is the reason behind the rise of “leftist radicals”, like SYRIZA in Greece, Podemos in Spain or Jeremy Corbyn in Britain, or of “right wing radicals”, like Marine Le Pen in France. The fact that the same phenomenon is present in the United States, with Sanders and Tramp, is one more indication that what we are facing here is not just a crisis of European integration, but a very deep economic (albeit “postponed”, “localized”, still under control) economic, political and even cultural crisis of Western capitalism, of the kind that produced in all history, Wars, Revolutions and Counter-Revolutions. Such a conclusion is not very popular, even among European radical politicians, for a very simple reason. If true, it would put them in front of very serious challenges they don't want to face. By the way, the unwillingness of the SYRIZA leadership to face, straigth ahead, the problems it would unavoidable face coming to power, was the main reason for the Greek disaster of last July. One important positive element of the situation, is the beginning of a discussion about the expediency of Euro, the architecture of Eurozone and even the expediency of belonging to the EU (in Britain). There are not any more the “Europe” and “Euro” taboos, which deterred for decades any serious discussion in the continent on where it is heading. But the discussion about euro, as important and central may be, is hiding sometimes a more general and deep problem. What should be the relation of European nations, as long as they still exist, to the wider system of “globalization” (and the emerging new “Empire” hidden under this name). How they could face its consequences, inside or outside the Eurozone, or even the EU? Is it maybe necessary to defend national sovereignty, but is it enough? International Finance, or, to be more precise, its politically and strategically coherent wind, do have a strategy. And the more extremists among them are answering to the crisis and are using it to accelerate the transition from “neoliberal” to “disaster capitalism” and to enlarge the War with the East (Russia, Islam, tomorrow China). They will need, sooner or later, authoritarian regimes in Europe to implement their projects. But the opposite camp (or the camp which is pretending to be the opposite) still has not many ideas on what and how to do. We discussed some time ago those questions and the future of our nations and Europe with Steffano Fassina, ex-Vice Minister of Economy and Finance of Italy. 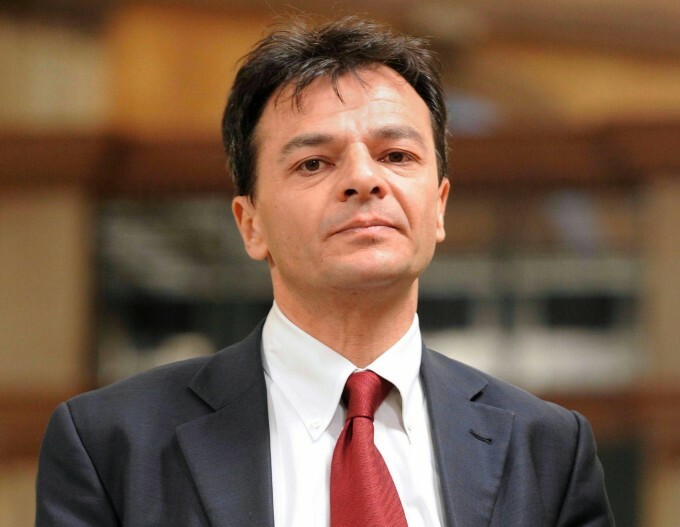 Fassina has left the government after a disagreement with the line of PM Mateo Renzi. He is now in the center of an effort to reunite and put some new life into the forces of the Italian Left. Proponent of an “orderly” dissolution of the Eurozone, he advocated after the Greek debacle, last July, a kind of Alliance of “national liberation Fronts”, to counter the Euro dictatorship, which should include both leftist and sovereignist forces. Here is an excerpt of the discussion we had. D.K. What do you believe is the future of European state-nations in the light of Greek and southern Europe experience? What has to do a nation if it wants to “escape” the “euro-prison”, while other nations are not ready or willing, facing the probability of "markets" retaliation? S.F. The events of last July in Greece made it clear to everybody that European states which joined the common currency have already lost their sovereignty, and their voters' democratic choices are irrelevant. The euro has become a cage, a prison, as you say. It enhanced asymmetries among countries, among debtors and creditors. Unaccountable bodies, such as the European Central Bank, are able to overturn democratic choices and have the last word on national policies. This is not only incompatible with any progressive policy, it is at variance with democracy itself. A radical change, a change of the European treaties would be necessary to restore democracy, to restore a space for social policies, to stop the degradation of labour and the dismantling of what remains of our welfare states. Unfortunately, I have become very pessimistic about the possibility to achieve such a change cooperatively within the euro. D.K. You seem to exclude any possibility of deep, radical reform of euro before going for the “dissolution of euro” scenario? But nobody has ever seriously tried to push for such a reform. S.F. I try to be realistic. Against the possibility of a change are the national interests of creditor countries, first of all Germany, supported by part of the élites in peripheral countries, who think this is an opportunity for a neoliberal restructuring of our societies. The German government has made it clear in many occasions that they will never accept anything like a transfer union, which means that they will never accept any mutualization of debt or any move to make the European Central Bank a real central bank, i.e. a lender of last resort. The current recipes on the table involve more structural reforms, i.e. neoliberal reforms of the labour market, and deeper financial integration, but do not contemplate anything close to the radical reform we have in mind. Should we move to some kind of political union, such union would reflect the current balance of power, it would institutionalize the current policy orientation. It would be institutionalized austerity. I'm not saying a leftist government should unilaterally leave the euro. But I think that such a government should seriously consider this possibility for two reasons: first, nothing meaningful has been done to prevent a new crisis from hitting the eurozone again, and in that case a breakup of the euro is a likely outcome, no matter we want it or not; second, having a “plan B” at hand means that our bargaining position is much stronger if we want to defy the European austerity policies and in case we find ourself in a position similar to Greece in July. D.K. Inside or outside Euro, any leftist government would face formidable obstacles to apply even a slight "deviation" from neoliberal orthodoxy. What is the answer to this challenge? S.F. This is true only in part. It is true that an exit from euro is not in itself the solution to our problems and that there is no way to get back to any “golden age” of national sovereignty. But, on the other hand, we should not underrate the role played by the common currency, and how the euro has become a formidable instrument that serves the neoliberal project. Through the common currency, the project of European integration has been hijacked. Either we find a way to change the balance of power and reform it, or there is no future for the Europe we have long dreamed of. S.F. This is a very complex question and I am not able to answer it in a few words. One think I want to say about Syria is that we should not repeat the same errors of the last decades, when Western countries responded to the terrorist attacks starting a war that made things even worse than they were before. There are too many contradictions and ambiguities in the way Europe and the US have dealt with the many conflicts in the Middle East, and it is clear that the problem is more political – how we imagine e peaceful Middle East and how the expansive ambitions of too many players can be limited – than strictly military. Sure this is not a clash of civilization, this is not a holy war, and this is not even a “war” in any conventional sense. The crisis is already influencing the situation in Europe, but I think we should not let it affect our rights and liberties, our way of life, nor our humanitarian attitude towards refugees; if we let it change us, terrorists will have already won.